At Advanced Showers we manufacture a range of leakproof shower pods that are perfect for any residential or domestic build or renovation. It’s no surprise that architects and developers are choosing leakproof shower units instead of tile and tray for residential and domestic developments. The days of post-build shower maintenance problems are over. Installation is a clean and easy one day job for a single tradesperson. The result is a lifetime zero maintenance shower where tiles never come loose and leaks are a thing of the past. Home owners love them because it’s one less home maintenance hassle. They look great and have a long lifespan. Shower pods add value to any development. Shower pods are delivered on site from our Coventry factory in two or three interlocking sections. These fit through any door, stair or corridor for assembly in location. Installation is then very straightforward and completed in a few hours. Every developer or project manager knows that the risk of things going wrong increases with the number of tradespeople involved in a task. Shower pods score many points over tile and tray showers because you only need one individual. Made from durable GRP, our shower pods really do look good. They enhance any bathroom with their long life high gloss finish. Take a look at our range of shower pods and see what a wide variety you have to choose from. The top end models are totally at home in any high end prestige development with a range of finishes and options. They fit snugly into alcoves and corners, or can be installed against a wall. The variety of standard sizes means there is a perfect model for your plans. Find out more about how shower pods from Advanced Showers work and the many advantages they deliver for residential and domestic developments. 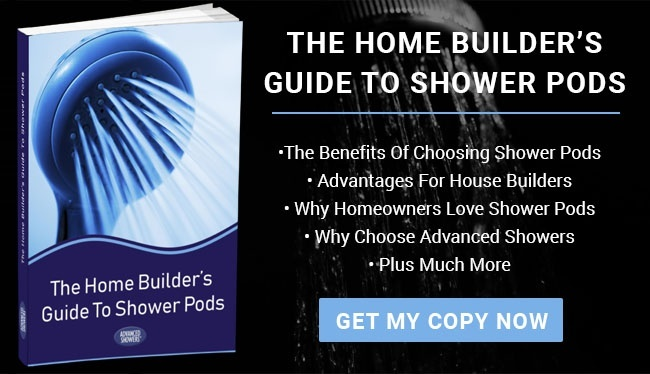 Download our free eBook The Home Builder’s guide to Shower Pods.